Organic. Great taste 2017. Naturally wholegrain. High in fibre. Naturally low in saturated fat. No added salt or sugar. Suitable for Vegetarians. Kosher. 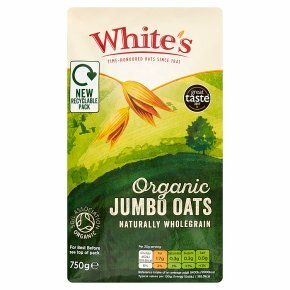 May help reduce cholesterol* *Porridge oats are a source of soluble fibre beta glucan which has been shown to reduce cholesterol. High cholesterol is a risk factor in the development of coronary heart disease. One 30g serving provides 1.3g of beta glucan soluble fibre which is 45% of the suggested daily intake of 3g of beta glucan. 1. Place 30g of oats into a large microwaveable bowl, add 180ml of milk or water and stir.2. Place bowl in the microwave and cook on full power for the time specified below800w = 5 minutes1000w = 4 minutesDo not cover bowl.3. Stir midway through cooking time.4. Allow porridge to stand for 2 minutes and serve.Cooking times may vary according to microwave wattage. 1. Place 30g of oats into a saucepan and add 250ml of milk or water.2. Bring to the boil, reduce the heat and simmer for approximately 7 minutes until all the liquid has absorbed, stirring occasionally.3. Remove from heat and allow to stand for 1 minute.